Of all the books and articles I have read over the years, Get Paid to Fish is one best that I have come across. It is well thought out, easy to read and easy to understand. It speaks directly to how Social Media, videos and other technologies can greatly benefit the anglers who are in the know. Whether you’re just starting out or if you have been at this for a long time, Get Paid to Fish can teach everyone a thing or two about sponsorships and what it really takes to get paid in the fishing industry. BASSIN’ USA: I have to say upfront I think “Get Paid to Fish” is a tremendous resource for the aspiring tournament angler. Why did you decide to write this book? BERNIE: Thanks for the positive input, we have been getting a lot of positive feedback. Jim and I discussed how difficult it was to obtain sponsors these days, and we felt we had something to offer because of our decades of experience on so many sides of the equation. I have been a sponsored tournament angler and a tournament director who worked with many of the largest companies in fishing. Jim had experience in marketing for Mercury Marine and other tackle companies, plus he’s a pioneer in walleye tournaments. We discussed this with some people in competitive bass fishing and with some marketing people, and we felt we had some pointers to share. Kevin VanDam then told us that he gets dozens of requests for sponsorship from aspiring anglers wanting to be a part of the KVD brand. He said the vast majority of them had no idea how to go about it, and that’s what we found throughout the business side of fishing. So we sat down and put together this book as a guide to walk a person through the process of how to be successful in being a part of the business side of fishing. BASSIN’ USA: How many years have you been involved with the sport of fishing? in walleye fishing. I still fish a few local events, but I am no longer fishing or running walleye tournaments. I am a co-director of a large multispecies event in the Brainerd lakes are that is a fundraiser for Teen Challenge drug and alcohol treatment centers. We raise about a quarter million dollars a year on this one-day tournament. I actually have the most fun fishing a Wednesday night bass league with my wife as a partner. BASSIN’ USA: If you had to choose only one fishing lure to take with you on a bass fishing trip, which one would you choose and why? BERNIE: Boy I hate to think of only taking on lure, but I have a lot of experience with a spinnerbait and that’s my go-to bait so I suppose that would be it. BASSIN’ USA: In the book, you talk about Mark Martin and he states that many young guys ask him about making the move into full-time fishing and promoting, but after he tells them all that it entails, they say “Nah, I just want to fish. That’s too much work.” How do you feel about the younger generation and the future of Professional fishing? BERNIE: There are a lot of really good young fishermen out there right now. It’s amazing how competitive it is at all levels. But making money fishing is all about working hard and working smart at promoting and selling products and services. You can be the best angler on the water at any tournament, but if you aren’t personable, professional, and able to represent a company in a way that helps them sell their stuff, they couldn’t care less about how many fish you can catch. 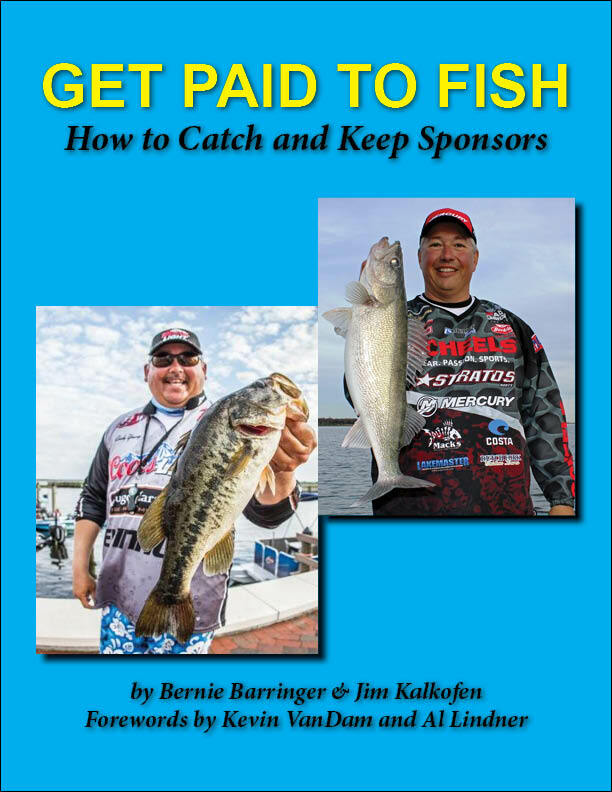 In this way, the title of the book is a little bit of a misnomer because nobody really gets paid just to fish, they get paid to promote and sell products through their fishing. BASSIN’ USA: What is the number one thing you would recommend to someone that wants to seriously start a career as a professional angler? BERNIE: Learn to sell. I know that’s not what most anglers really want to hear, but it’s the honest truth. These companies that are sending out a check to anglers are doing it because that angler has proven that he/she can make a positive impact on sales. Start small and work your way up the ladder. Look to local companies first, and ask them for entry fees in exchange for their logo on your boat or a seminar in their store. That looks really good on a resume when you approach a major manufacturer. Don’t use the shotgun approach to choosing who you want to partner with, choose the companies you like; the companies that you already know their products and use them. When you approach them, ask them what you can do for them and how they would be willing to compensate you. Most will start you with some free product or discounts, and that’ okay, as long as you feel there is room for moving up the ladder. Get your foot in the door, then WOW! them with your ability to promote. The checks will come. BASSIN’ USA: The internet has definitely changed the climate of fishing today, with social media, YouTube videos, etc. There are many great anglers out there that don’t fish professional tournaments, but they are promoting themselves and their knowledge. Do you think that companies are more willing or open to sponsor Anglers that are not considered Professional Anglers today due to this change? BERNIE: Absolutely! I know of guys who have fishing instructional YouTube channels who are making good money, these are very good anglers who have a knack for explaining and showing things. Far as I know they don’t fish any tournaments. Social media is a big part of every company’s marketing budget these days. Who knows that the next big thing will be, but there are certainly ways to get sponsors involved without putting on a lot of road miles to tournaments. BASSIN’ USA: I see many aspiring anglers walking around with corporate logos printed all over their tournament jerseys. Would you recommend anglers take on a lot of small sponsors who are willing to offer compensation today, or focus on getting one or two “key” larger sponsors in the hopes that after they have demonstrated their ability to positively impact the bottom line, there’s a better long term reward? BERNIE: Those with a lot of logos in many cases are just getting free product or discounts and in many cases have a pretty low ceiling. That’s not always the case, but if you really want to get a nice quarterly check so you can quit your real job, then you will need to align yourself with a small number of companies that will allow you to grow with them as you prove your value to them. Most companies get dozens of requests per week from anglers looking for sponsorship, and many of them will offer you product discounts if you have proven that you are a good angler fishing a fairly high-profile event. But unless you really show them that you can make a difference in their profits, product discounts are all you will ever get from them. Choose your partners carefully and really work hard for them. These companies are not charities. If they are going to send you a paycheck, they expect something in return; something much more than just wearing a logo. BASSIN’ USA: You discuss in your book how it is important for sponsored anglers to align themselves with websites like BASSIN’ USA.com, the media and other content providers. Without going into too much detail, can you explain the general importance of this? BERNIE: All websites need good content to drive traffic. Anyone who can write fairly well, take some nice photos and provide content to websites that will engage the reader will always have a market for it. This works great for everyone involved, the websites benefit by increased traffic, the writer has a platform to build his personal “brand” and mention his sponsor’s products, and of course the reader receives something of value. BASSIN’ USA: Over the years I’ve spoken with many tournament anglers who are left riddled with debt because they took a shot at professional tournament fishing as a career. Many had good sponsors, but said they just couldn’t win at that level. In your opinion, how important is it for an angler to be able to place in the money throughout the tournament season? BERNIE: I’m afraid many anglers have unrealistic expectations. You don’t have to be an angler of the year or win a big event to make your sponsors happy, but you have to fish well enough to have the respect of your peers to validate your sponsor’s investment in you. It’s a fine line that can be complicated by the fact that you may have to be staying up late logging your activity reports, making calls, or maybe appearing in an in-store event when you would rather be prefishing. It’s a hard line to walk sometimes. Many people just don’t have the drive it takes to keep grinding away when you would rather hit the snooze button. BASSIN’ USA: Now that your book is complete, is there anything else you wish you had added? BERNIE: Not at this point, but I do want to make it clear that nobody just goes fishing and gets paid for it. There are days when getting paid to be in the fishing industry is a grind. But the benefits are unbelievable for anyone willing to start small, go through the process and work hard at it. Most of the best paid anglers today worked hard to lay the groundwork for making a big move when their moment came. That moment might be winning a big event, or it might be–and this is more common than you might think–when they simply met the right person at the right time. Little things can mean a lot. I don’t know about you, but when it comes to fishing, I’m not shy about letting people know how I feel about the sport. I’ve got so many different bass fishing shirts, hats, hoodies and jackets I’m running out of space in my closest. Recently we came across a company “Fishin Decals” who as their slogan states make “Awesome Decals for Avid Anglers”. They’re some of the most detailed images of game fish that I’d ever seen. The details on the largemouth and smallmouth bass are really spot on. These decals are designed to go on just about any flat surface, like cars, boats, kayaks, tackle boxes, mailboxes, etc. I got one of their largemouth and smallmouth bass decals (actual decals seen above). They look great on the window of my truck and my fishing buddies are asking where they can get some. They even have small decals that you can put on your fishing rods. Fun, rugged, lifetime warranty, quick, agile, stable, mobile, hardly any draft and well worth the money describe BASS CAT’s entry into the below ten grand fishing boat market. The AWESOME Baby Cat is named the PHELIX. Bass Cat is the oldest bass boat builder with the same ownership from beginning to present day. No lost warranties with this company. I had seen Bigmouth, the first of Glenn Lau’s movies about the Largemouth Bass many years ago when it first made its way through the Bassin’ world. I remember watching in awe and wondering where in the world was a place with so many bass, and where was the water so clear it seemed as though you could see 40 feet.